Sulphide Gulch has a number of quality chutes. The approach is a bit traversy and you have to skin a short distance on your way out, but not too bad. 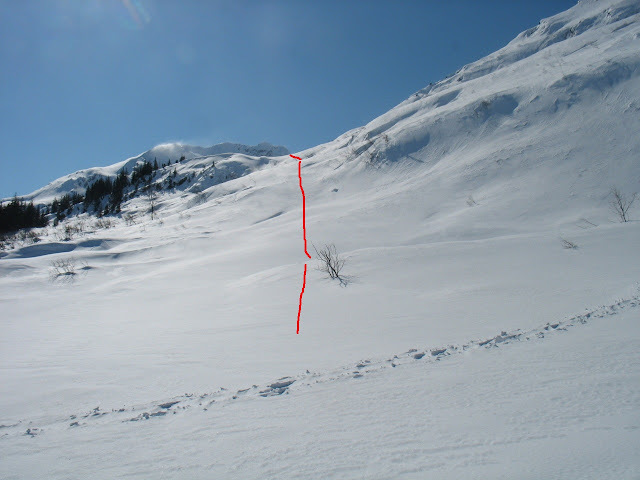 The first lines you come to are the east facing chutes, which you drop into from an open area just beyond Square Rock. From Valdez, turn right on Dayville Road and drive just under a mile to the plowed pullout on your right. This pullout is immediately after the second bridge crossing the Lowe River. From the pullout skin under the power lines until you get to the pipeline right of way. Head up the pipeline for a mile or so, before contouring up toward Square Rock. Topo of the route here - red is up, green is a sampling of the downhill options, described later. Keep contouring. You encounter one or two steep rollovers and a handful of minor drainages interspersed with fairly level terrain. The shot below shows getting onto the glacier between Mt Francis and Square Rock. Keep going across the glacier to the pass. 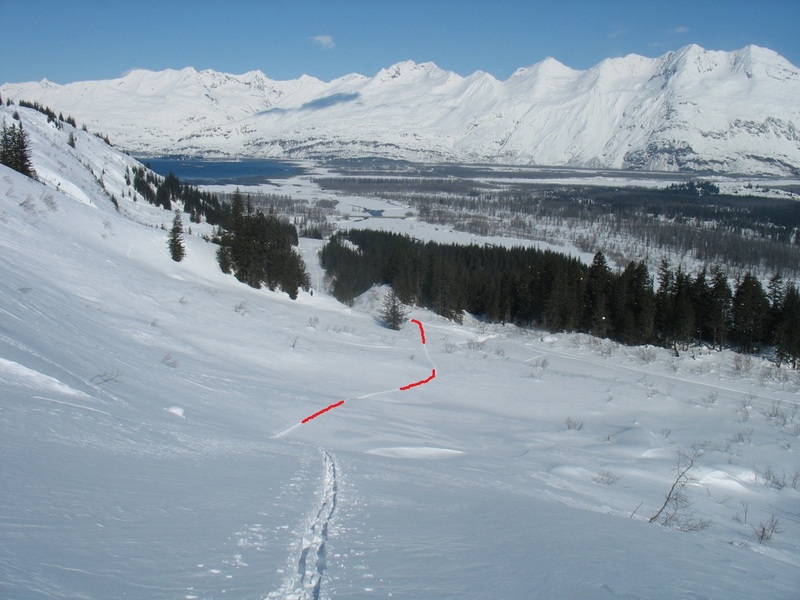 The competent skinner can make it from the car to the top of the chutes with no switchbacks, although it may take a time or two to get used to the contours between the pipeline and the end of the skinning. Here's what your entrances look like into Sulphide Chute 1 (labelled with the 1) and Suphide Y Chute (labelled with 2A and 2B). Chute 1 is 1900 vertical feet, ese facing, 39 degrees. Y Chute is 1600', east facing, 39 degrees. Entrance 2B is narrower. Once you ski one of the chutes, you might as well boot up the other side and ski the 4819 North Ramp. The ramp, pictured below, is about 600 vertical feet at 41 degree, facing nnw. 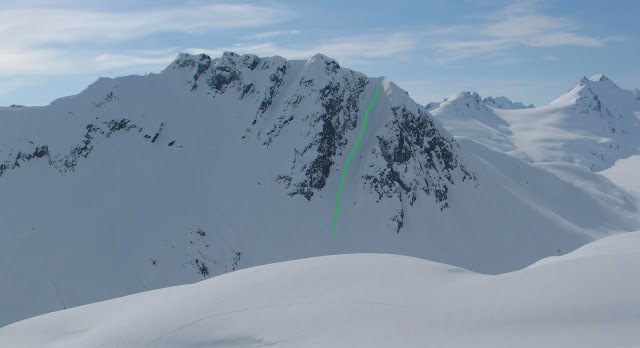 As you can tell from the topo there's a fair amount of open skiing coming back into Suphide after you exit the ramp itself. When you're in the neighborhood you'll notice plenty of other fun skiing, but this should get you started. When you've had enough, ski out Sulphide Gulch, trending skier's left toward the bottom of the gulch, until you intersect the pipeline. Skin up as far as necessary, then ski back to the car. 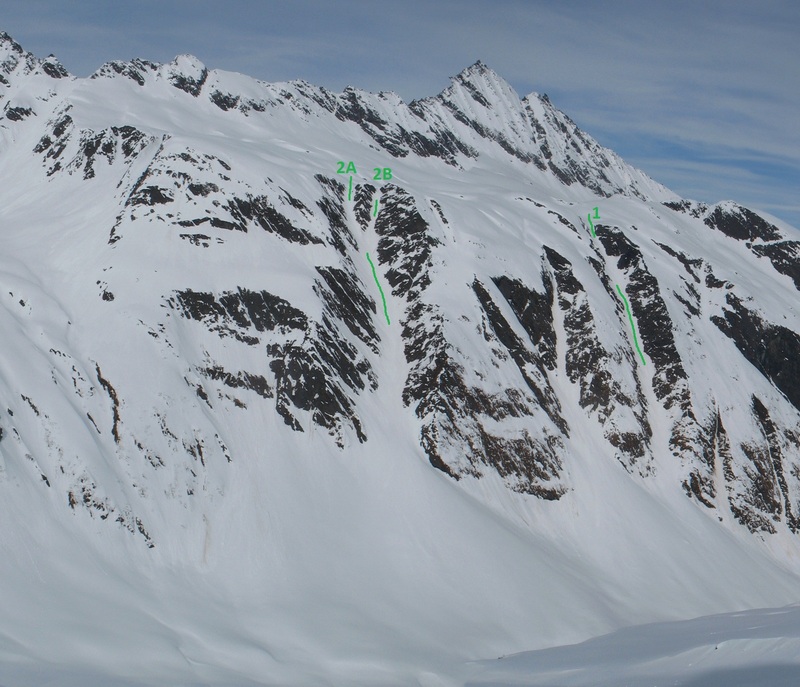 Suphide Gulch has numerous slide paths pouring into it - as always, pick a stable day. The approach has some exposure as well.